Most guests who arrive via airplane take the South Tahoe Express from the Reno, NV airport to the Lakeside Casino in South Lake Tahoe. 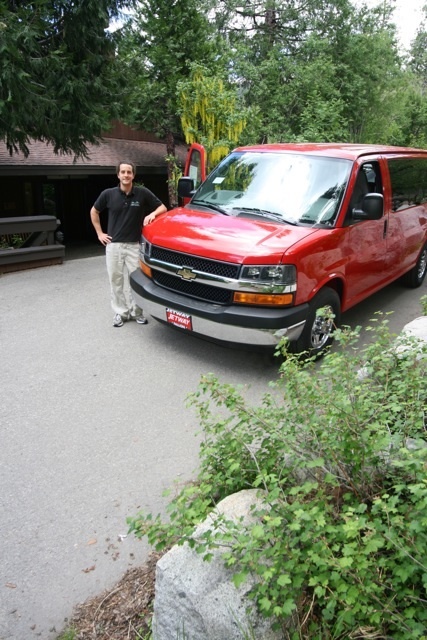 Be sure to exit the shuttle at the Lakeside Casino where a red Stanford Sierra Camp shuttle van will bring you and your family to Camp. Arrange for your shuttle pickup from the Lakeside Casino to Camp with the Camp reservations staff at least two weeks prior to your arrival. Please provide us with the flight number, flight times, and number in your party. Please also let us know if your flight details change, as we arrange the shuttle based upon guest request. Departing guests are dropped off at the Mont Bleu Casino. The arrival and departure locations allow for you to spend the least amount of time on the shuttle and more time at Camp!